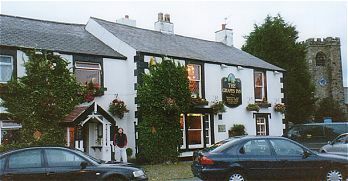 The Grapes Inn is an excellent 'proper' village pub to visit if you're in this part of central Lancashire. It’s popular with a range of local groups who regularly meet here in the function room. The pub’s also unusually got its own bowling green! I visited on my way home from a week up in the nearby Yorkshire Dales at the tail end of the 2001 Foot and Mouth outbreak. Goosnargh is a about 5 miles north east of Preston and is reachable by bus from Preston. By road, if you head north from Preston on the A6, and about half a mile beyond Junction 1 of the M55 (just off the M6 at Jct32) turn right onto the B5259. After a couple of miles you’ll enter Goosnargh and you’ll find the Grapes is off left down Church Lane by the village green and the lovely old church. Next time I return I’ll probably head up on the bus from Preston so that I can fully appreciate their fine real ales – they run at regular intervals during the day with a more limited service during the evening. I was particularly impressed by the friendliness of the staff and of the locals – it certainly had the feel of a popular well managed pub. Comfortable interior with a big open coal fire in the middle to keep you warm in the colder months. Along with Tetley Dark Mild and a couple of regular real ales they usually offer 3 guest beers typically from small breweries at very reasonable prices. Excellent particularly well kept beer and some very unusual guest brews – the landlord’s clearly a connoisseur of fine ale. For the hungry food is available at lunchtimes and evenings every day bar Monday and Tuesday evening. Good range of food from sandwiches to very generous helpings of Sunday roast which I sampled. Very tasty and filling. Good specials on offer with local produce used where possible.